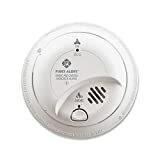 Smoke detectors beep for two primary reasons: to indicate that they’re working properly during a test and because they are in need of a new battery. 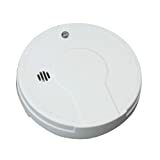 Most smoke detectors have a test button located on the front of the detector. It’s important to press this button from time to time to confirm that the smoke detector is still in working order. Pressing the button should cause the smoke detector to emit a long, loud beep. This lets you know that the battery and/or electrical connection are working properly. When a smoke detector starts beeping on its own, the usual cause is a low battery. 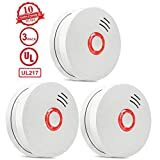 Even a smoke detector that’s directly wired into the home electrical system may have a battery installed to provide backup power in the event that the house loses electrical service. When the battery, usually of the rectangular, 9-volt variety, becomes low, the smoke detector will beep to alert you to change the battery. This can happen at any time, including at inconvenient times such as the middle of the night, so don’t be concerned if your smoke detector begins chirping or beeping at 3 a.m.. Intermittent beeping never represents the presence of smoke or fire. It’s only an alert to inform you that it’s time to install a new battery. Just because beeping is intermittent, it doesn’t necessarily means there smoke or fire. To stop a smoke detector from beeping, you must disconnect or replace the battery. Taking a battery out of a smoke detector and leaving it out is a very bad idea. It puts your home at risk of undetected fire. It’s best to put in a fresh battery as soon as possible. To replace the battery, grasp the smoke detector firmly and rotate it to one side. Most smoke detectors will detach from their mounting brackets when rotated to the left, but you can try both directions. Once you feel the detector loosen from the wall, pull it gently towards you. Be careful of wires that connect hard-wired smoke detectors to the wall as it’s important not to pull so hard that you accidentally disconnect them. Since it’s recommended to replace your smoke detector every ten years you might consider replacing hard wired smoke detectors. Then remove the old battery and insert a new one. To remount the detector, line the back of the smoke detector up with the wall bracket, pressing it gently against the wall. Rotate it in the opposite direction you used to remove it, stopping when you feel resistance. Proper disposal of dead batteries depends on the type of battery and your home’s location. Alkaline batteries – these don’t pose a health or environmental risk and can be disposed of with normal household trash, except in California, which has special legislation. Lithium Ion batteries – these must be disposed of through a household hazardous waste collection point or battery recycling drop off. Don’t simply toss them into the trash. Smoke detectors can be a crucial part of a complete home security monitoring system. If you’re interested in learning more about the benefits and features of monitored security, please Protect America for a free quote. Our systems include monitored smoke detection in addition to the standard motion sensors, HD wireless video cameras, and other cutting edge security tools.